2D QRD provides twice the diffusive specular attenuation of a 1D QRD. Wide range of wood finishes . Can be surface or flush mounted. 100mm deep plus 15mm battens if required. 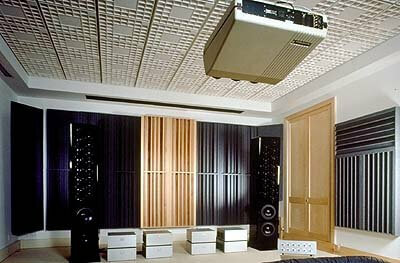 Conventional acoustic treatments have relied on absorption for reflection control. Unfortunately, this can deaden the room and make it unsuitable for speech or music. Diffusive ceilings are one of the most effective ways to simultaneously control room reflections and provide a natural ambiance. The Omniffusor uniformly scatters sound arriving from any direction into many directions, providing ideal distribution and coverage. Its unique shape creates an attractive, visually interesting acoustical surface. Specular reflections from flat, hard surfaces cause strong reflections that corrupt speech intelligibility and degrade music quality. Typically, fabric wrapped absorptive panels are used to control interfering reflections, with the undesirable side effect of deadening the space. The Omniffusor is the first 2D QRD. It offers twice the reflection attenuation of the 1D QRD, because it scatters sound uniformly into a hemisphere. The Omniffusor provides uniform, omnidirectional, broad bandwidth diffusion in an attractive ceiling or wall design element. While the primary function of the Omniffusor is to provide broad bandwidth diffusion, it also offers a modest and beneficial amount of absorption across the frequency spectrum with a small emphasis at about 800Hz. The Omniffusor offers significant diffusion compared to a flat reflector panel above the diffraction limit of 565 Hz, which is determined by the dimensions of the panel. Above this frequency, the graph indicates how the reference reflector becomes more and more specular as the frequency increases, whereas the Omniffusor provides a constant diffusivity. 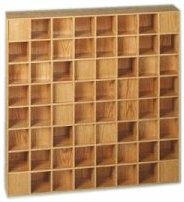 Wooden Omniffusors can be wall mounted. For wall installation, plexiglass Omniffusors should be flush mounted into a framed opening. Decorative trim can be added to conceal the perimeter joint. 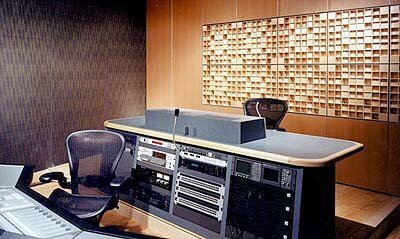 Custom Audio Designs reserves the right to alter the specifications of any product without notice.